Sold out in eight countries worldwide, Daniel Goldman of CASA theatre festival brings this “Kaufman-esque mash up of the Shawshank Redemention and Inception” to London. Review by Anna Warhurst. Thebes Land is an encapsulating and disorienting play from Sergio Blanco, a Uruguayan playwright, which forces us to question and confront how we construct stories. Craftily structured to blur the lines between reality and mythology, this engaging performance delivers moments of sharp tantalising humour. At first, all eyes are on Martin, a young man dressed in a grey tracksuit, enticingly performed by Alex Austin with his lowered gaze and abrupt manner. 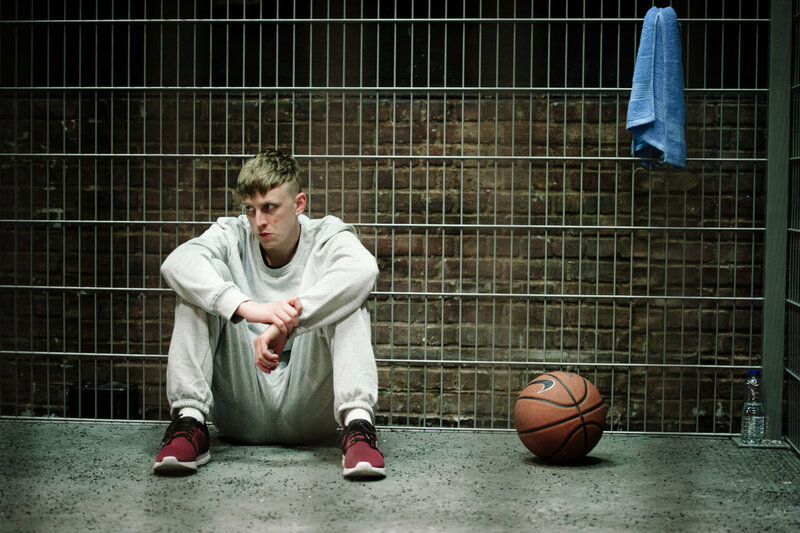 Convicted of patricide, he sits with his head hung between his knees in a tall cage, void of anything but a basketball hoop. Our narrator, forty-something writer T tells us he intends to bring the story of a convicted killer to the public—dramatizing interviews he had with Martin throughout their relationship where he reveals what drove him to stab his father to death. We quickly learn that the Ministry of Justice refused to allow the real Martin to appear on stage, which led T to recruit an actor, Freddie, who is amusingly also played by Alex Austin. The imposing CCTV cameras hung above the cage add yet another perspective from which we watch the action take place, and serve as a constant reminder of the pervasion of surveillance over the protagonist. Blanco keeps us wanting with this piece whilst retaining an apologetic and self conscious quality. T, with his references to Kafka, Greek myths and Dostoyevsky is at odds with the rawness of uneducated Martin, whose incessant questioning of T’s motive for the play is often laced with a profundity and vulnerability that forces you to question your position as audience and author of the story. As it gathers pace, this seemingly clear symbiotic relationship throws surprises that leave you wondering way after you leave the theatre.